Vladikavkaz (Russian: Владикавка́з, IPA: [vlədʲɪkɐˈfkas], lit. ruler of the Caucasus; Ossetian: Дзæуджыхъæу, translit. Dzæudžyqæu Ossetian pronunciation: [ˈd͡zæwd͡ʒəqæw], lit. Dzaug [ru]'s settlement), formerly known as Ordzhonikidze (Орджоники́дзе) and Dzaudzhikau (Дзауджика́у), is the capital city of the Republic of North Ossetia-Alania, Russia. It is located in the southeast of the republic at the foothills of the Caucasus Mountains, situated on the Terek River. Population: 311,693 (2010 Census); 315,068 (2002 Census); 300,198 (1989 Census). Vladikavkaz is one of the most populous cities in the North Caucasus. The city is an industrial and transportation center. Manufactured products include processed zinc and lead, machinery, chemicals, clothing and food products. The city was founded in 1784 as a fortress during the Russian conquest of the Caucasus and was for many years the main Russian military base in the region. The Georgian Military Highway, crossing the mountains, was constructed in 1799 to link the city with Georgia to the south, and in 1875 a railway was built to connect it to Rostov-on-Don and Baku in Azerbaijan. Vladikavkaz has become an important industrial center for the region, with smelting, refining, chemicals and manufacturing industries. The city is one of the largest in the Russian-controlled Caucasus, along with Grozny, and was the capital of the Mountain Autonomous Soviet Socialist Republic, a Soviet Republic established after the annexation of the Mountainous Republic of the North Caucasus. The puppet state existed from 1921 to 1924 and was part of, and in some cases incorporated, the modern-day territories of Chechnya, North Ossetia and Kabardino-Balkaria. From 1931 to 1944 and from 1954 to 1990, its name in both Russian and Ossetic languages was Ordzhonikidze (Орджоники́дзе) (after Sergo Ordzhonikidze, a Georgian Bolshevik), and from 1944 to 1954 it was officially called Dzaudzhikau (Дзауджика́у) in Russian and (Дзæуджыхъæу) in Ossetic. Vladikavkaz resumed its old Russian name, in 1990, shortly before the dissolution of the Soviet Union; the official Ossetic name was reverted to Дзæуджыхъæу (Dzæudžyqæu). Vladikavkaz was fought over in both the Russian Civil War and World War II. In February 1919, the anti-Communist Volunteer Army under General Anton Denikin seized the city, before being expelled by the Red Army in March 1920. In November 1942, the forces of Nazi Germany tried unsuccessfully to seize the city but were repelled. On November 26, 2008, Vitaly Karayev, the mayor of Vladikavkaz was killed by an unidentified gunman. On December 31, 2008, his successor, Kazbek Pagiyev, was also killed by unidentified gunmen. Vladikavkaz is the capital of the republic. Within the framework of administrative divisions, it is, together with six rural localities, incorporated as Vladikavkaz City Under Republic Jurisdiction—an administrative unit with the status equal to that of the districts. 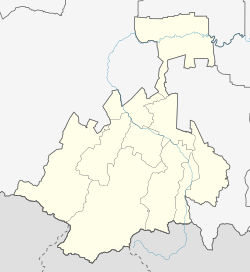 As a municipal division, Vladikavkaz City Under Republic Jurisdiction is incorporated as Vladikavkaz Urban Okrug. The city is served by the bus network (marshrutkas). There are also tram (since 1904) and trolleybus (since 1977) networks, plus the main Vladikavkaz railway station. The city is served by Beslan Airport located about 9 kilometres from the city. The Georgian Military Road, which is a part of European route E117, starts in Vladikavkaz and it connects the city with the South Caucasus. FC Alania Vladikavkaz is an association football club based in Vladikavkaz, who won the Russian Premier League in 1995. In Vladikavkaz, there is a guyed TV mast, 198 meters (650 ft) tall, built in 1961, which has six crossbars with gangways in two levels running from the mast structure to the guys. North Ossetian State University is in the city. The city's primary religion is Eastern Orthodox Christianity, which is followed by Russians, Georgians and some of the Ossetians. The rest of the Ossetian population adheres to the next largest religion, Uatsdin, an Ossetian folk religion, which nationwide is followed by 29% of the population. The remainder follow Protestantism, Islam, Armenian Orthodoxy and other beliefs. Vladikavkaz experiences a humid continental climate (Köppen climate classification Dfb) with warm, wet summers and cold, drier winters (though very mild for Russia). ^ a b Энциклопедия Города России. Moscow: Большая Российская Энциклопедия. 2003. p. 75. ISBN 5-7107-7399-9. ^ "Собрание представителей". vladikavkaz-osetia.ru. Archived from the original on April 21, 2017. ^ "Приветственное слово главы АМС г. Владикавказа". vladikavkaz-osetia.ru. Archived from the original on April 26, 2017. ^ Sputnik. "День города по-владикавказски". sputnik-ossetia.ru. Archived from the original on April 27, 2017. ^ region15.ru. "15-й РЕГИОН: Владикавказ". «15-й РЕГИОН». Archived from the original on April 22, 2017. ^ "КОНСТИТУЦИЯ РЕСПУБЛИКИ СЕВЕРНАЯ ОСЕТИЯ - АЛАНИЯ (с изменениями на: 10.05.2017), Конституция Республики Северная Осетия - Алания от 12 ноября 1994 года". docs.cntd.ru. Archived from the original on September 28, 2016. ^ "Europe | Southern Russia mayor gunned down". BBC News. November 26, 2008. Archived from the original on December 4, 2008. Retrieved April 25, 2010. ^ "Pogoda.ru.net" (in Russian). Archived from the original on May 16, 2012. Retrieved September 8, 2007. ^ "World Weather Information Service – Wladikavkaz". United Nations. Archived from the original on November 25, 2009. Retrieved December 31, 2010. Верховный Совет Республики Северная Осетия. 12 ноября 1994 г. «Республика Северная Осетия-Алания. Конституция.», в ред. Конституционного Закона №5-РКЗ от 4 декабря 2013 г. «О внесении изменений в Конституцию Республики Северная Осетия–Алания». Вступил в силу 7 декабря 1994 г. Опубликован: брошюрой "Конституция Республики Северная Осетия–Алания". (Supreme Council of the Republic of North Ossetia. November 12, 1994 Republic of North Ossetia–Alania. Constitution., as amended by the Constitutional Law #5-RKZ of December 4, 2013 On Amending the Constitution of the Republic of North Ossetia–Alania. Effective as of December 7, 1994.). Закон №34-РЗ от 9 июля 2007 г. «Об административно-территориальном устройстве Республики Северная Осетия-Алания», в ред. Закона №44-РЗ от 12 ноября 2013 г. «О внесении изменений в Приложение к Закону Республики Северная Осетия–Алания "Об административно-территориальном устройстве Республики Северная Осетия–Алания" и Закон Республики Северная Осетия–Алания "Об установлении границ муниципального образования Алагирский район, наделении его статусом муниципального района, образовании в его составе муниципальных образований — городского и сельских поселений"». Вступил в силу со дня официального опубликования. Опубликован: "Северная Осетия", №148(24949), 16 августа 2007 г. (Law #34-RZ of July 9, 2007 On the Administrative-Territorial Structure of the Republic of North Ossetia–Alania, as amended by the Law #44-RZ of November 12, 2013 On Amending the Appendix to the Law of the Republic of North Ossetia–Alania "On the Administrative-Territorial Structure of the Republic of North Ossetia–Alania" and the Law of the Republic of North Ossetia–Alania "On Establishing the Borders of the Municipal Formation of Alagirsky District, Granting It the Status of a Municipal District, Establishing Municipal Formations—Urban and Rural Settlements—Within Its Structure". Effective as of the official publication date.). Закон №10-РЗ от 5 марта 2005 г. «Об установлении границ муниципального образования город Владикавказ, наделении его статусом городского округа», в ред. Закона №34-РЗ от 19 июля 2006 г «О внесении изменений в Закон Республики Северная Осетия-Алания "Об установлении границ муниципального образования город Владикавказ, наделении его статусом городского округа"». Вступил в силу 1 марта 2005 г. Опубликован: "Северная Осетия", №43 (24344), 15 марта 2005 г. (Law #10-RZ of March 5, 2005 On Establishing the Borders of the Municipal Formation of the City of Vladikavkaz and On Granting It Urban Okrug Status, as amended by the Law #34-RZ of July 19, 2006 On Amending the Law of the Republic of North Ossetia–Alania "On Establishing the Borders of the Municipal Formation of the City of Vladikavkaz and On Granting It Urban Okrug Status". Effective as of March 1, 2005.). "Vladikavkaz" . Encyclopædia Britannica (11th ed.). 1911.